In my last blog, I wrote about the importance of setting the scope of a project. This week, I’d like to focus on what “deliverables” are, why to include them in any proposal, and the importance of being specific when defining them. By being clear and upfront about what deliverables you can offer, your client will know from the beginning what items they’ll be able to keep. You’ll also avoid losing out on profits if a client demands a costly deliverable that wasn’t specified in the proposal ahead of time. A deliverable is any tangible survey data or item that comes from the results of your work. Deliverables can include, for instance, a topographical map or aerial photographs of a parcel. Copies of CAD files and title documents you collected are also deliverables. Or, if you used stakes or measuring rope to mark a client’s property, they too can be classified as deliverables. 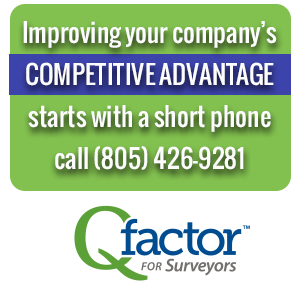 With Qfactor for Land Surveyors’ proposal feature, you’ll be able to easily list every deliverable. Although a client contracts you for a particular deliverable, it’s still essential to put down in writing what they will explicitly get to keep at the end of the project. Thus, when wondering if you should include an extensive list of deliverables in your proposal, the answer is always: yes. Even in small and straightforward projects, issues can arise due to a lack of preparation. For instance, in the case of stakes used to mark a parcel, will the client be keeping them after completion of a project? Or will you be removing them? Although the answer may seem like common sense to you, a far less-informed client may worry or protest, thus fracturing your professional relationship. Remember: Every deliverable is a valuable product of your work. Thus, it’s important to include each one within even the most basic of proposals. If you are using Qfactor, you can use the proposal builder feature to create a template in that features a list of deliverables. By using this template for all similar projects, you’ll not only save time and effort, but you’ll also ensure that you don’t leave out any vital data or items. Including a list of deliverables in a proposal may initially seem straightforward. Yet, by neglecting to be specific about which deliverables you’ll be providing and in what format, there’s the potential to run into trouble with your client. For example, if you’ve been hired to produce a topographical map of a client’s property, you’ll want to define whether you’re responsible for only handing over one paper copy of that map. Will your client demand multiple copies? Will they expect a digital copy as well? Or, if your proposal states that you’ll be providing your client with aerial shots, you should also consider what that handoff looks like. Will those shots be in color or black and white? Again, how many copies will your client be expecting? By outlining the details of each deliverable you’ll be providing at the end of a project, you’re far more likely to avoid confusion and conflict. You’ll also be able to discuss the scope and type of each deliverable with the client beforehand so there are no unexpected costs on either end.